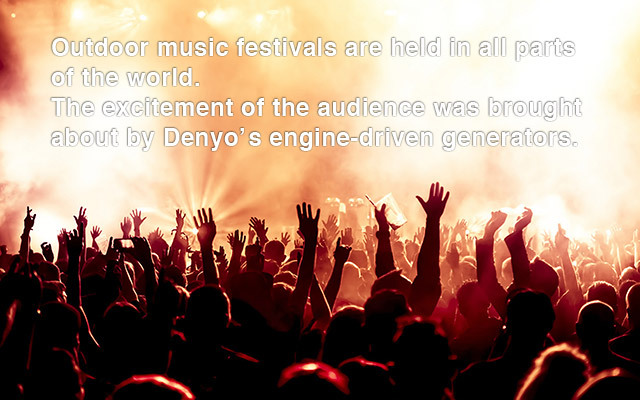 [Support outdoor festivals] | Denyo Co., Ltd. In recent years, numerous world-class outdoor music festivals have been held in countries that were once referred to as developing nations. 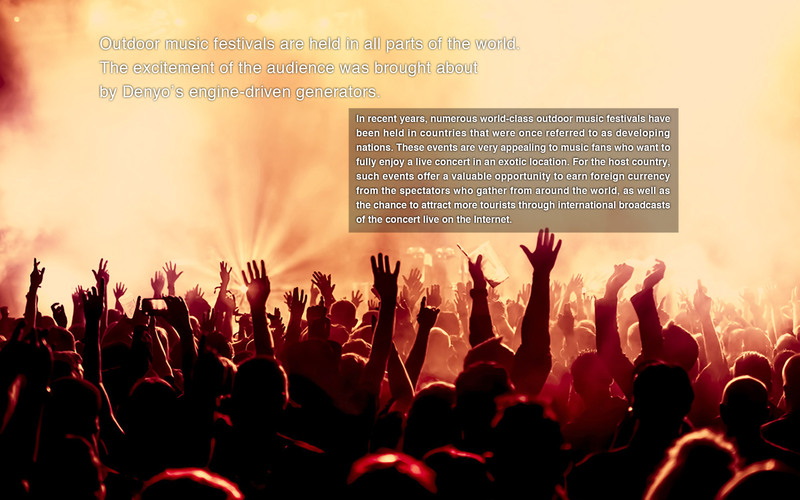 These events are very appealing to music fans who want to fully enjoy a live concert in an exotic location. For the host country, such events offer a valuable opportunity to earn foreign currency from the spectators who gather from around the world, as well as the chance to attract more tourists through international broadcasts of the concert live on the Internet. When holding a festival, the organizers have to worry not only about selecting the artists and attracting an audience, but also about securing electricity. Power supply in regions that are still developing is far from stable. If power lines are extended to a planned venue located off the grid and a long way from the city, there can be numerous power outages in a single day, and it is impossible to hold a festival in those circumstances. In such situations, Denyo engine-driven generators are the choice of organizers. The amount of electricity needed to power the giant PA speakers, mixers, lights and other equipment for a single day is comparable to that required at a medium-sized factory. Nevertheless, Denyo’s engine-driven generators, which are capable of parallel operation, can easily produce as much electricity as needed, when it’s needed. Denyo products, known worldwide for their toughness, are also uniquely capable of overcoming the challenges of hot and humid weather conditions. 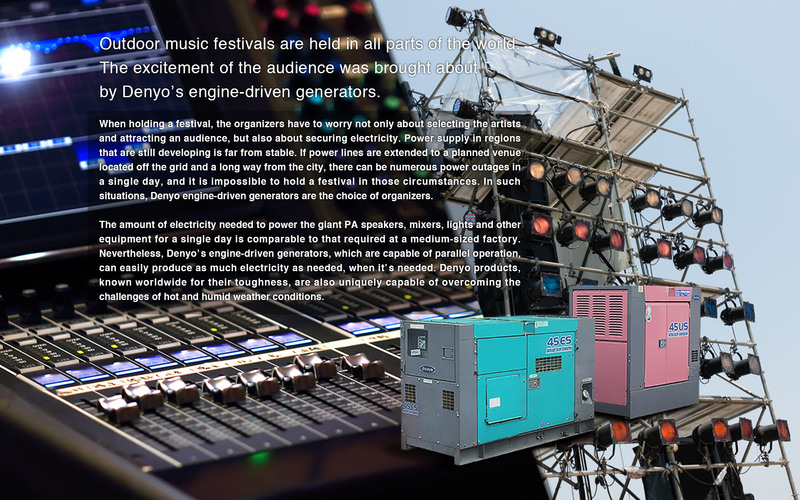 Denyo’s engine-driven generators are chosen as power sources for this kind of outdoor music festival not only because they are easy to use and reliable. 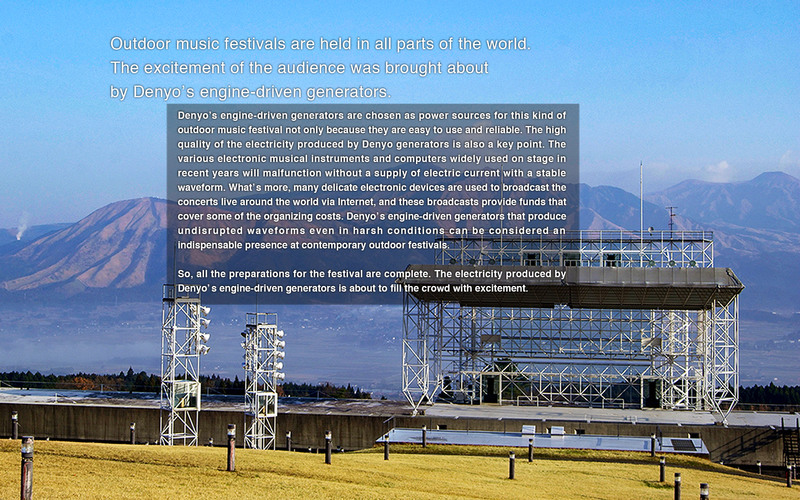 The high quality of the electricity produced by Denyo generators is also a key point. The various electronic musical instruments and computers widely used on stage in recent years will malfunction without a supply of electric current with a stable waveform. What’s more, many delicate electronic devices are used to broadcast the concerts live around the world via Internet, and these broadcasts provide funds that cover some of the organizing costs. 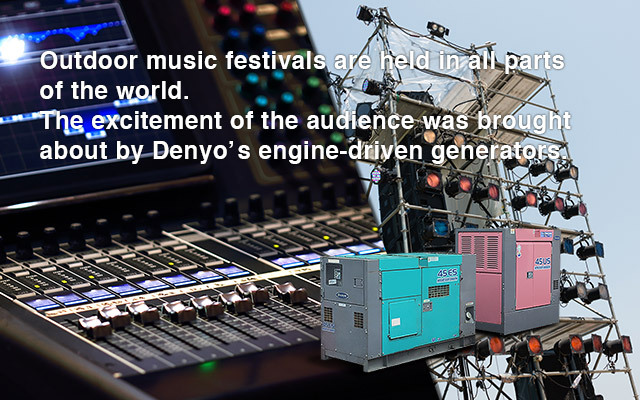 Denyo’s engine-driven generators that produce undisrupted waveforms even in harsh conditions can be considered an indispensable presence at contemporary outdoor festivals. So, all the preparations for the festival are complete. 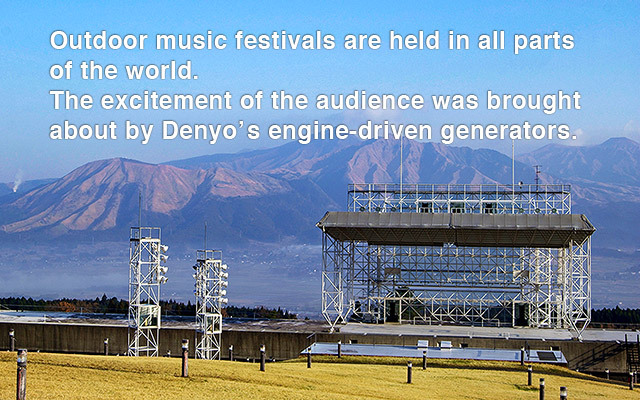 The electricity produced by Denyo’s engine-driven generators is about to fill the crowd with excitement.